Even though I was born in 1970, and thus theoretically am old enough to have heard the 70s rock, I could never embrace that decade’s sounds among my favorites. My love of heavy music began and was due of what I heard in the 80s. I remember how all of our high school (or at least that small portion of the crowd who were into something not only heard through Soviet TV and radio) was split in two camps. The crowd of Deep Purple, Led Zeppelin and Queen vs. the one I called home, who were into Judas Priest, Iron Maiden and Accept. Sure enough, with time I learned to appreciate Black Sabbath, but I could still be in the minority as Dio’s years, not Ozzy’s, are my favorite era. 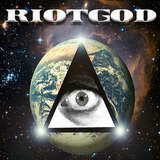 Riotgod, a new band creation from the Monster Magnet rhythm section players Bob Pantella (drums) and Jim Baglino (bass), takes it roots in the 70s rock and as hard as it tries, it does not get my blood boiling, although this self-titled debut is plenty respectable. Crusader has that classic 70s feel in its riff and many a song here have the trademark radio friendly chorus onto which Riotgod fellas latch on and can’t quite let go (Light of the Sun, Collapsing Stars). A winner in live setting, this band may get the crowds of biker-rockers on their side, repeating the refrains, but with its all too quiet studio recording and the way too obvious desire to hook the listener with its all too familiar rock’n’roll, I am not always a believer. Pinata can be more fiery, but the immediate follower Drone Station is a little too Bon Jovi for my liking. At the same time, Americans as they are, Riotgod adds the feeling of Pacific Northwest grunge and something else rather southern fried to the Deep Purple oriented riffs (Hightime, Horizon). Never a fan of Nirvana or Soundgarden, I could do without the droning angst in Light of the Sun and Horizon, but the gruff Southern feel adds a good deal of character to some of the songs. To be entirely fair, Riotgod, the album, is rather diverse, within its own realm, of course, not every song sounding like a one-note radio hit. 9th Life pushes the waves of music in layers, with the most expanded guitar lead, The Time Is Now has an unusual percussive flow, and Sweet Kaos sticks wholeheartedly to its dense, pressure rising, bluesy nature. The band even goes for a pair of interludes, an instrumental Omega, its mid-Eastern spacey desert mirage feeling, cosmic title and all could have come from Crimson Glory’s Astronomica, and Rift brings its melody from the Highlands and uses vocalist Sunshine’s voice modulations to the fullest. Speaking of Sunshine, he is advertised as the topmost attraction, and his range is vast, but he alone can’t take ho-hum songs and vault them over the top. And since I mentioned Crimson Glory and another vocalist who went with the nature sounding pseudoname, when the songs are to die for, they leave the mark (Crimson Glory, Transcendence), but when they are rather dull (Midnight’s Sakada), no outstanding vocals can save them. The axiom proved true once again on Riotgod. I sound perhaps too critical, just because it was the band’s self-professed goal to set everyone’s balls on fire with Riotgod. Its production not masculine enough and its songs not in your face enough, the album is more of a fizzling firecracker than a steadily burning torch. If advertising of “gripping rock’n’roll” was a little less obvious, the album may have gone over better.